This month I’ve prepared a special M.I.K.E. Push Tribute Mix. It features many of his recent productions and remixes, but also comes with my Intro Edit of a timeless Plastic Boy classic. Enjoy! Tic Tac Trance #109 Replay available! Happy New Year! I hope you all had a good start into the new year and that most of your goals will be accomplished! 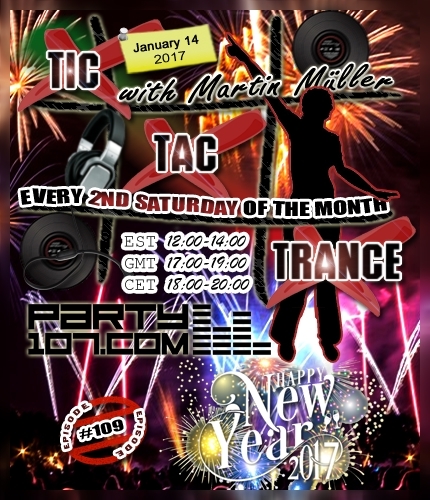 Episode #109 of Tic Tac Trance will be broadcasted on January 14 2017 on Party107.com. This time I’ve prepared an uplifting & psychedelic 2 hours mix which features tunes of labels like Perfecto Fluoro, Damaged, Flashover, FSOE, High Contrast and many many more! Make sure to tune in! Check out your local time HERE or join the EVENT on Facebook! Motorcycle – Around You (Martin’s Tic Tac Trance Edit of AvB) Giveaway! I’ve getting lots of requests to give away this one. So I asked Dave Dresden for his permission. And he gave it a go! So here it is! The download package also includes my special Intro Edit, which I played as “Thank You” for Jes Brieden’s Vocal Drop in Tic Tac Trance 095 with Martin Mueller (November 14 2015). I wish you all a Happy New Year 2017! As promised in the last year, Part 2 of my 9 hours Anjuna Trance Classics Mix is now available! Did you miss Part 1? Don’t worry, it’s als available on my Soundcloud page over HERE.